If you live in New York City, you know the only constant is change. You have had your heart broken time and again when beloved stores and restaurants shutter. Yet, there are some places that have been around for so long they feel like landmarks and the idea of them closing is unimaginable. A La Vieille Russie, the art and antiques emporium filled with world class Russian treasures, is just such a place. The boutique had been situated on the corner of 59th Street and Fifth Avenue in retail space of the historic Sherry Netherland Hotel for 56-years. When the sign went up in the window that A La Vieille Russie was moving out, it was yet another heartbreaker for those of us who felt the shop was a touchstone of old New York. Well, there was no cause for serious alarm. While ye old Russian jeweler is no longer on the street level for easy window shopping, it is still alive and well. A La Vieille Russie (otherwise known as ALVR) reopened just one block away at 745 Fifth Avenue in a glorious second story space with spectacular wraparound windows and views of Bergdorf Goodman, The Plaza Hotel, Central Park and their old corner of The Sherry Netherland. Once you walk into the new digs you realize, the décor was very much a part of what made ALVR a landmark. The new interior is airier than the old space, but the sense of history remains with the antiques and paintings of Russian nobility not to mention, of course, the jewelry. In celebration of the new galleries ALVR is staging its inaugural exhibition from May 1 -18, 2018 of objects and jewels titled Celebrating Royal Fabergé – The Return. The “Return” in the title covers the homecoming of ALVR Fabergé items from a museum exhibition, Royal Fabergé, at the Sainsbury Centre for the Visual Arts in Norwich, England, which also included 65 items from Queen Elizabeth’s collection. 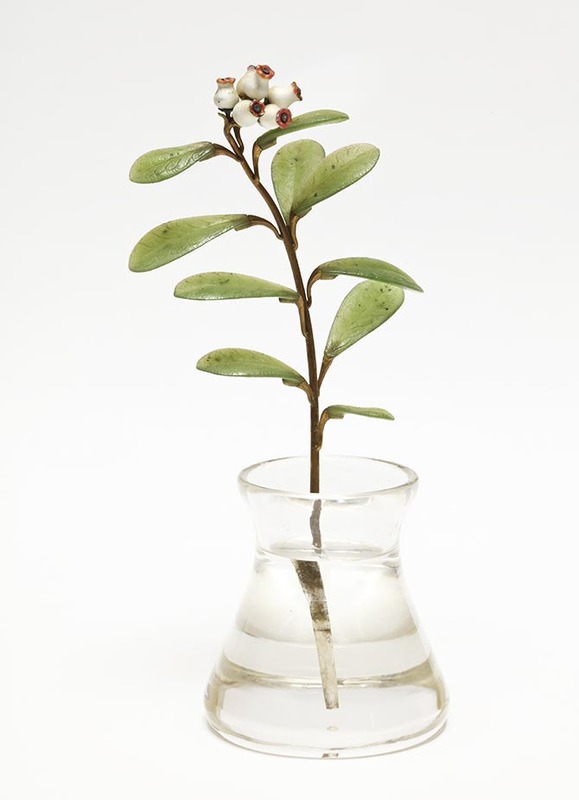 The Return exhibit marks the first time the Fabergé works of art will be shown together in the United States. It includes a gift to ballerina Anna Pavlova presented by Czar Nicholas II and his wife Alexandra Feodorovna, a sculpture related to Charles Darwin, a five-color gold double marriage cup, a Japanese-inspired dessert cutlery set, a potato carved from pink-brown agate, and little sculpture of the Russian gypsy singer Varvara Panina, the most famous of the Fabergé figurines, along with many other majestic masterpieces. 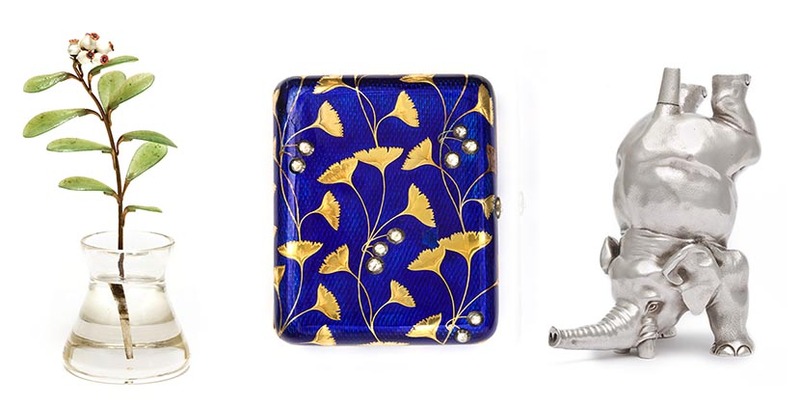 See several highlights from the show below and if you are in New York City make your way to A La Vieille Russie at 745 Fifth Avenue, Suite 415 between May 1 to the 18. The exhibit is open to the public, no appointment necessary, from 11:00am to 4:00pm Monday thru Friday. 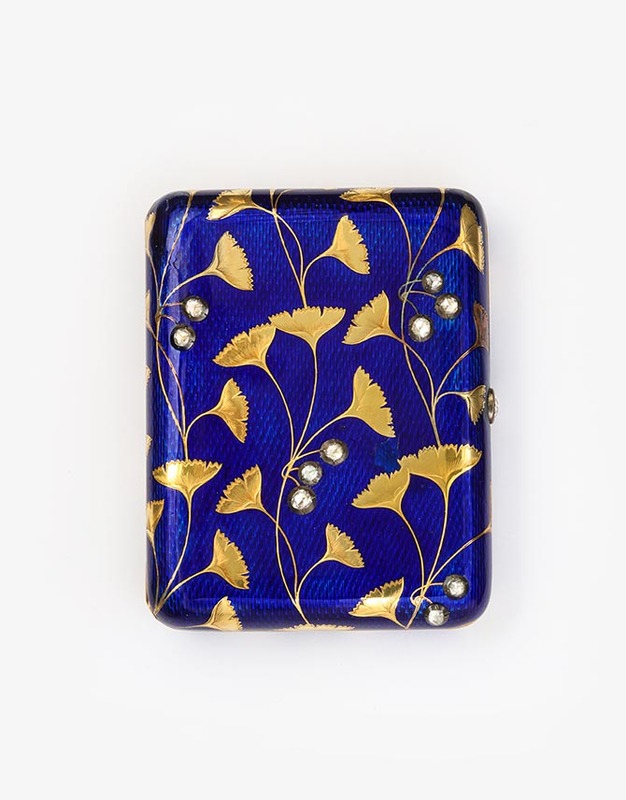 The Art Nouveau decoration of this gold and royal blue enamel cigarette case has an Egyptian-inspired design of gold gingko leaves with rose diamond buds. Wearing a Panagia, or icon pendant, distinguishes an Orthodox bishop from other clergy. 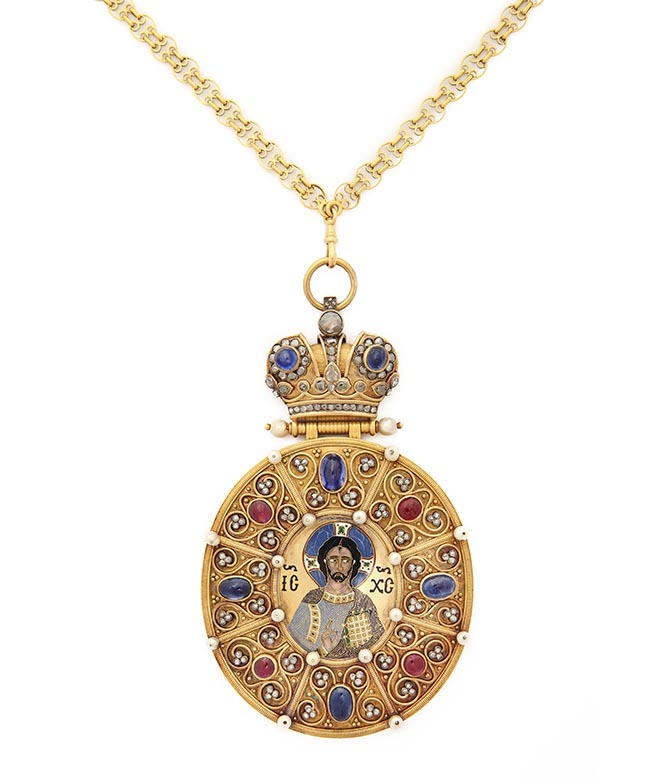 In a setting of gold, diamond, sapphires and pearls, this fine cloisonné enamel medallion of Christ Pantocrator is based on an 11th century Byzantine image in New York’s Metropolitan Museum of Art. 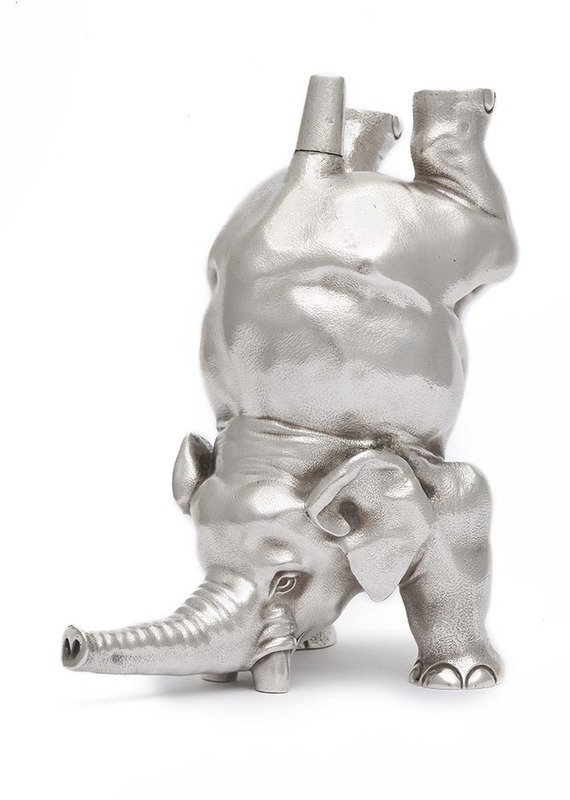 The elephant is the symbol of the Danish Royal Family. This stamp moistener holds glue in its body and has a brush in its tail. The red leather collar with metal bells and tag inscribed “Bobtail,” belonged to the French bulldog of Grand Duchess Olga, the youngest sibling of Russia’s last czar, Nicholas II. 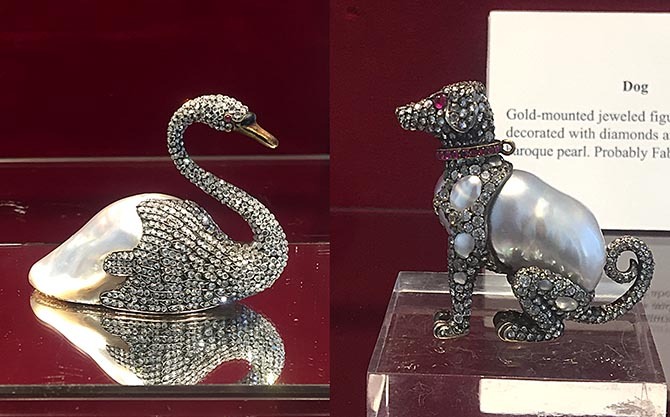 The swan was made for the Russian actress Elisabeth Balletta of the Imperial Michel Theatre. The dog figurine is attributed to Fabergé.